Today September 11th Barcelona celebrates the 300th anniversary of La Diada, the day in which the city was invaded and occupied by the army of the Two Crowns, in the year that marked the end of the War of the Spanish Succession. It was a very sad day for Catalonia but at the same time an important event that has influenced its people since then. Catalans have fought for 300 years with bravery to vindicate themselves after such ignominious events, to be reborn from the ashes and defend honor. There has been a gigantic demonstration downtown where more than one million Catalans have joined to create an incredible V that stands not only for victory but also for vote, vote for the independence from Spain. The hashtag V de la Diada has become world trend topic in just 15 minutes. We must say here that although not all Catalans want the independence, a great many do, as was proven today. And in honor of the truth, from those who are not in favor of segregation, many are against the Spanish government's policy against Catalonia as well. All in all, independence or not, Catalans are sick and tired of the historical manipulation coming from the government in Madrid. 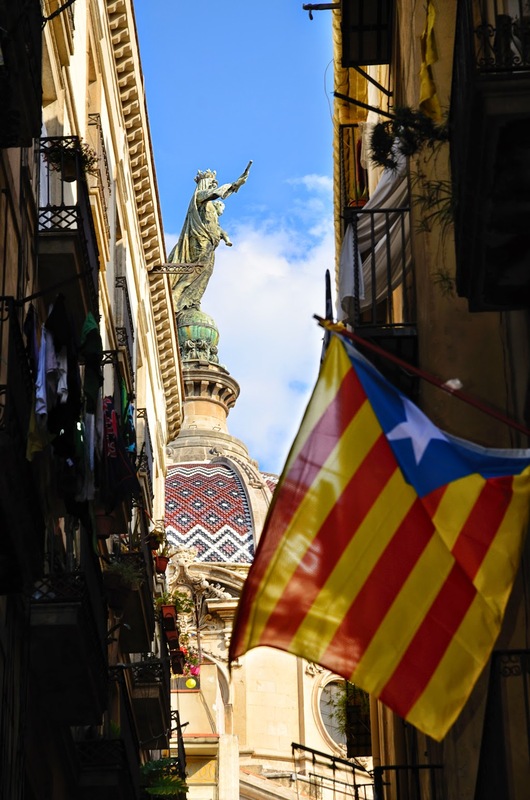 On this special day, I want to share this picture of La Merced, patroness of Barcelona with a beautiful "L'Estelada Blava" (The Blue Starred Flag), the flag of Catalan independence in the foreground.